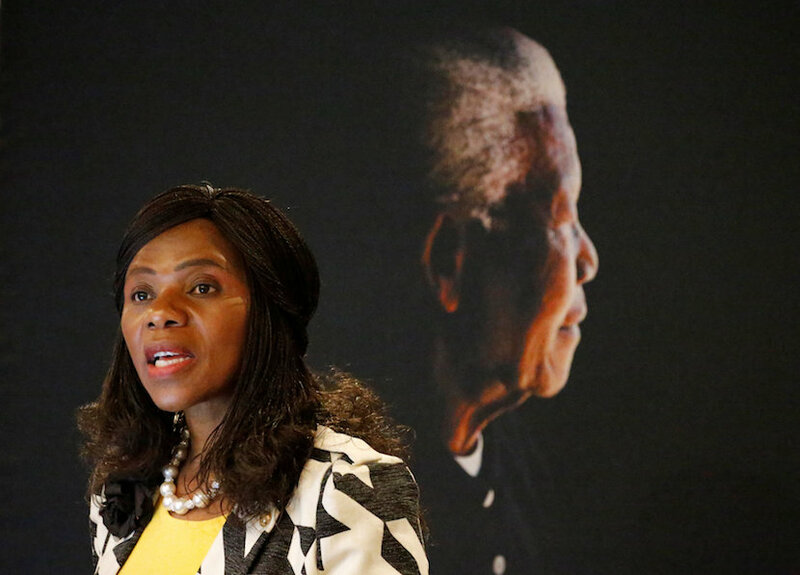 Boston, US – Thuli Madonsela, South Africa’s former public protector – a position tasked with investigating state and government misconduct – is best known for her resolve in standing up to President Jacob Zuma and holding him to account for wasting public funds on his private estate. Madonsela is sitting with colleagues in an otherwise empty lecture hall in the upper reaches of the Harvard Law School in Boston. The soft-spoken 54-year-old is particularly absorbed in events back home; it isn’t long before she is discussing the sequence of recent events that have shaken the country. On March 28, Ahmed Kathrada, an iconic anti-apartheid activist, died. Just hours after his funeral, Zuma fired the well-respected Finance Minister Pravin Gordhan and others from key portfolios in a major cabinet reshuffle and replaced them with his close associates in a move that enraged civilians, opposition parties and even leaders of Zuma’s own party – the African National Congress (ANC). Mourning quickly morphed into rage, with calls for mass action, including protests, echoing across the political spectrum. Zuma’s presidency has been marked by allegations of corruption and, for millions of South Africans, something snapped this week. Al Jazeera: So much has been made out of the events of the past week. Are you at all surprised by Zuma’s drastic cabinet changes? 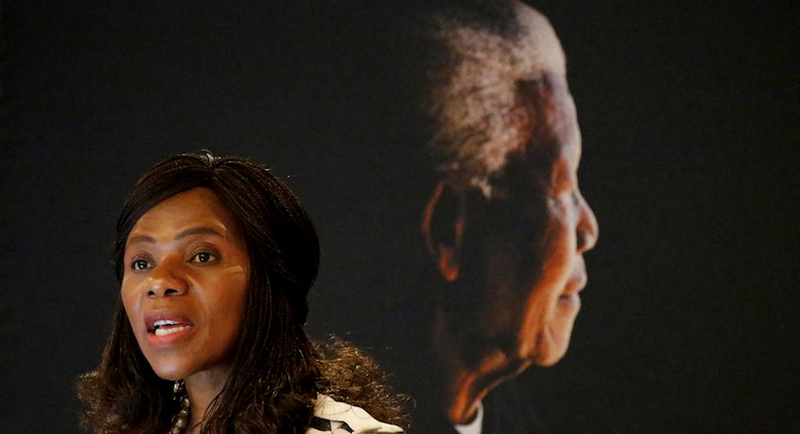 Thuli Madonsela (TM): It was both surprising and yet unsurprising. There have been a lot of excesses that the nation has tolerated and this has been just one of those. But what was surprising for me was the timing. I had expected that there would be a bit of a period of peace after the funeral of Ahmed Kathrada out of respect for him. But when [the cabinet reshuffle] happened, I thought that perhaps those actions were done so soon after the funeral because [Zuma] did not want to give the nation time to reflect and regroup and challenge the autocracy that has been taking place in the name of democracy. Al Jazeera: The move has prompted many calls for Zuma to step down. People are also planning to take to the streets. Do you think this is the way forward? TM: It’s not for me to tell the people what to call for. All I know is that if you’re a leader and you look back and find that no one is following, then you have no right to call yourself a leader. What people do is their choice, as long as they do what is lawful and doesn’t harm others. It’s their duty to act and to end whatever they don’t want. Al Jazeera: There has been a lot of outrage and anger from many different sections of society. What role do you think you played in public perception of recent events? TM: I look back and can say that somehow the public protector became part of the disruptive forces in terms of undoing the complacency when it comes to the abuse of public power for personal gain by people in higher office. The Scorpions [a crime-fighting unit that was discontinued in 2009] had shaken the institutions a bit, but it had never gone to the president. I somehow found myself having to deal with the propriety of the conduct of the president. Since then, South Africa has started talking about how entrusted officials should be behaving with public power. It got Africa talking about whether or not presidents should have unlimited access to or use of public resources. Today I go around the continent and people say that what happened in South Africa awakened them to the fact that nobody should have unlimited access to public resources. Everyone’s benefits as employees of the state should be defined and they shouldn’t take more than what is defined by law and policy. Al Jazeera: In the early 1990s you wrote a part of South Africa’s landmark constitution. I am guessing your resolve to see it upheld comes partly from that? TM: Absolutely. 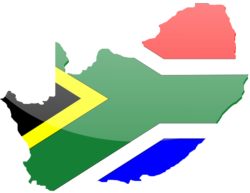 It came from having been part of the South African dream and having been a part of the constitution-building process. It also came from a history of having been told by my father what the liberation movement stood for. At the same time, from Mama Albertina Sisulu [the wife of Walter Sisulu, former secretary general of the ANC] I was told what the liberation movement was about. It wasn’t about implementing a piece of paper; it was a social pact introduced to ensure that we would never have a situation like the one we had under apartheid where the government did not operate under the rule of the people and was not held accountable. Al Jazeera: But today, we have talk that the constitution needs to change in order for land redistribution to take place. What do you make of these discussions? TM: With regard to the land question, I don’t think there’s any problem with the constitution. I think that when the government fails to implement the constitution it becomes an issue. 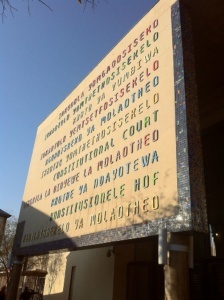 The property clause within the constitution outlines various ways for land redistribution. Under certain circumstances it does explain the expropriation of land. What failed is that the government did not pass laws to implement this. The constitution anticipates persistent structural racism and sexism [and] there are positive measures included to address this. The government has never used these measures. How are these mountains of inequality going to be dismantled without the implementation of an evolutionary way of dismantling structural inequality? Al Jazeera: At the same time, there has been a wave of young activists calling for free education and faster redress. Are you impressed by their persistence or are you afraid of their so-called ‘radical’ rhetoric? TM: I’m both excited and afraid. Excited that young people have awakened us to the reality of the existence of structural inequality, particularly with regard to race. They have awakened us to education as an equaliser, which we neglected in favour of Black Economic Empowerment [BEE]. BEE has left a lot of people behind in terms of education. Former Ghanaian President Kwame Nkrumah said that the way forward must be so that every child has access to quality education, which explains most African countries investing in education. South Africa, which has more universities than most African countries, has failed to invest. 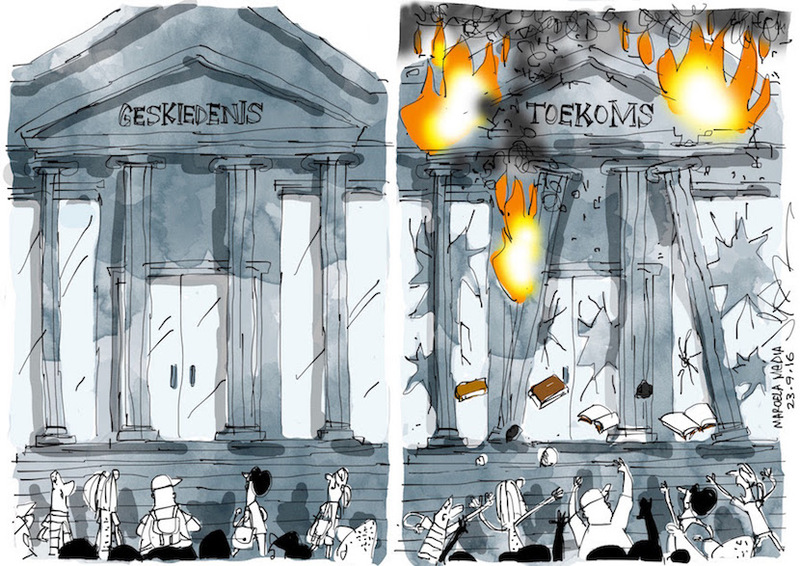 Universities and the future go up in smoke. More magic at www.jerm.co.za. I think that young people have done incredibly well to awaken us to this, but I’m worried about them being harvested for political gain. There is a hijacking of the movement towards extremism. 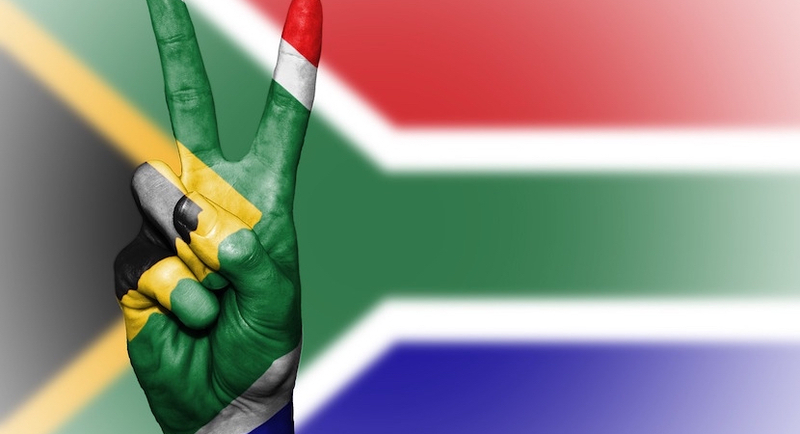 During my time, it was South Africans against the system of oppression, against racism, against apartheid. There was a unity between movements against the system. Now, instead of people fighting against inequality they are encouraged to fight amongst themselves using racial politics to fight white people. Al Jazeera: So the identity politics coming into play makes you afraid? TM: Yes. Once these ideas are fuelled and racial politics and ethnic divides spread to the rest of South Africa and people buy into this, when the politicians mess up the economy and steal the greatest share of things you fight each other over the crumbs. I think Madiba [Nelson Mandela] was a leader who was acutely aware that sexism and racism and these problems remained a reality but he understood that in times of political trouble people need to band together. Al Jazeera: But in a place like South Africa where whiteness means privilege, how does one escape identity in tackling redress? TM: I think you can talk about that without identity politics. You can engage with a system and make sure that a system allows for equal distribution without damning white people. We can acknowledge that they are beneficiaries of an unequal system and that we must put it back together. I think we are better off with white people joining the redistribution path voluntarily rather than alienating them. Look at what has happened in Zimbabwe and our country, where land has been taken and given back to the people and it has made no difference. People are given this hope that they will be given land and end up richer. The Bapo Ba Mogale were given land, they are not richer. The Bakubung people were given land where the Sun City Casino is. Are they rich? No. Land redistribution and radical economic transformation on their own mean nothing. There is now a new term: “white monopoly capital”. But if capital is the problem, then it is a problem – black or white. I think that white monopoly capital is a narrative brought in to place blame on something for people’s suffering, and everyone who disagrees is an “agent”. Al Jazeera: Finally, you have been lauded internationally and domestically for your work. How do you balance the needs of your job while understanding that you calling out corruption also plays into the hands of certain agendas? That you could be seen as Afrophobic because there is so much to do, and there is a larger project, and there’s you, coming in the way, talking about people stealing the scraps. TM: When I deal with people who laud me or praise me, I understand that everyone has their own agenda and they like me to the extent that there’s a confluence of interests between what they believe are my interests and their interests. But I’ve never been anyone’s particular agent and when it comes to the African story, I’m very Africanist. You can look at all of my international presentations; the Afrophobic story that says we are a dark continent that is corrupt is not accurate. We are a great continent. We have brought great things to the international community. Our problems are due to the greed of our own people and the greed of companies, but we have so much more to offer the world.